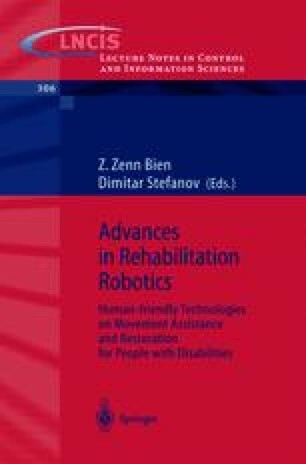 The research and development in the field of rehabilitation robots produced a multiplicity of rehabilitation robots available as off-the- shelf products or laboratory prototypes (e.g. ). The application scope of these systems is large and covers ranges such as support for everyday tasks, assistance in the vocational surroundings or support in health care. An in-depth analysis unveils that rehabilitation robots, which are intended for a flexible use but not for individual special applications, offer services only on a relatively low level of abstraction, i.e. the direct low level control of the system  remains by the user. This leads to a high cognitive load with accompanying concentration loss, especially for persons depending on interfaces like speech control or eye movement trackers. In order to relieve the users from this kind of tiresome control the treatment of tasks on higher abstraction level becomes desirable . The system should be able to perform chains of actions, which are repeated during daily life tasks, autonomously and/or with minimum necessary user interaction.